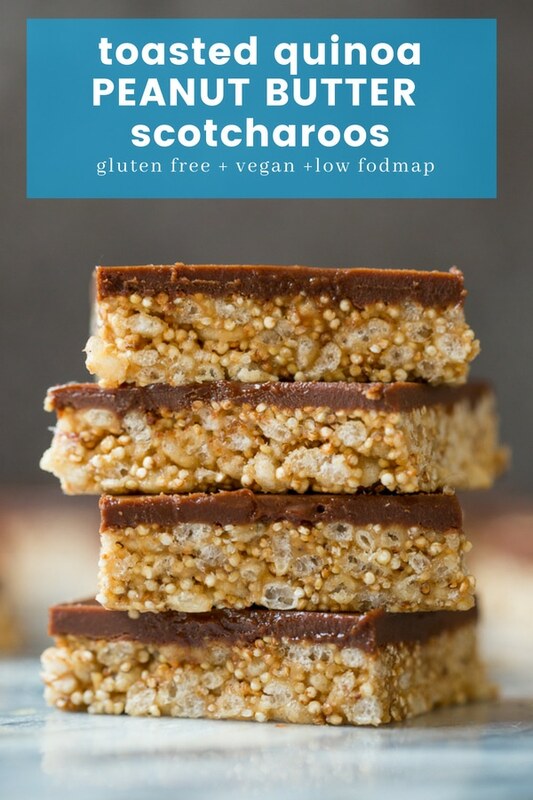 There’s a lot to love in these peanut butter scotcharoos and only 8 ingredients needed in these no bake snacks bars so let’s just get right to it! It all starts out with the crispy, toasted quinoa. But first things first – you need to rinse the quinoa. Why? Quinoa has a natural coating called saponin which can often times taste a bit bitter & soapy. All it takes is a quick rinse in a fine mesh strainer to get rid of all the weird bitterness & you’re good to go. 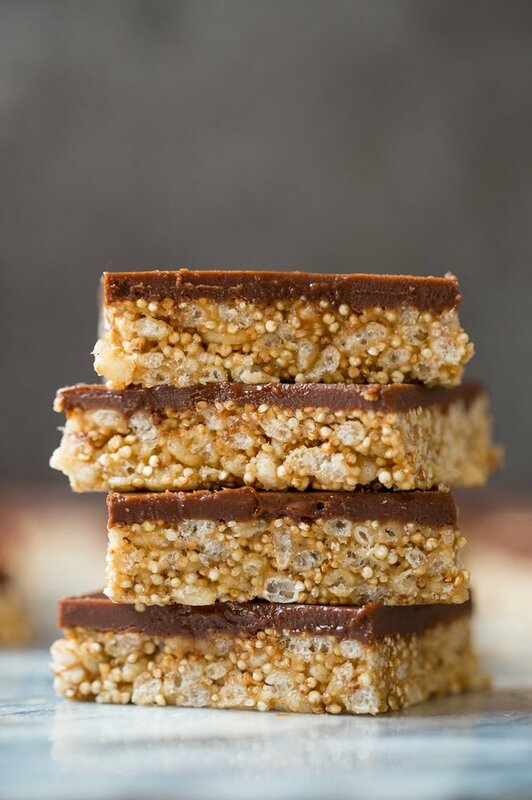 That being said loads of prepackaged quinoa comes pre-rinsed so if you’re felling eager to get on with making these peanut butter scotcharoos (And why wouldn’t you be?) you might be able to skip that step. 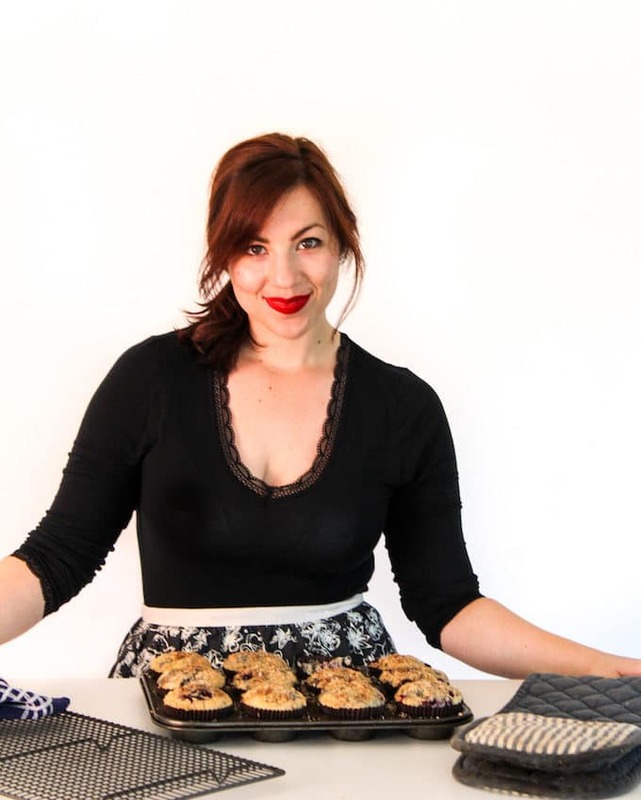 Onto the toasting – this part is really easy and is done in no time! Just spread out your quinoa over a wok or skillet and gently toast over a medium heat. After a minute or two you’ll hear the quinoa start to crackle and pop. Turn the heat down to low and stir so that the bottoms don’t end up burning. Keep doing this for a few minutes to crisp up the quinoa and make them crunchy enough to eat in a no bake treat. Once the quinoa is prepped move on to the peanut butter ‘glue’. It’s made up of only four ingredients: peanut butter, maple syrup, vanilla extract and sea salt. Whisk it all together over a low heat until combined and then pour it over your combined toasted quinoa & rice crispy cereal. 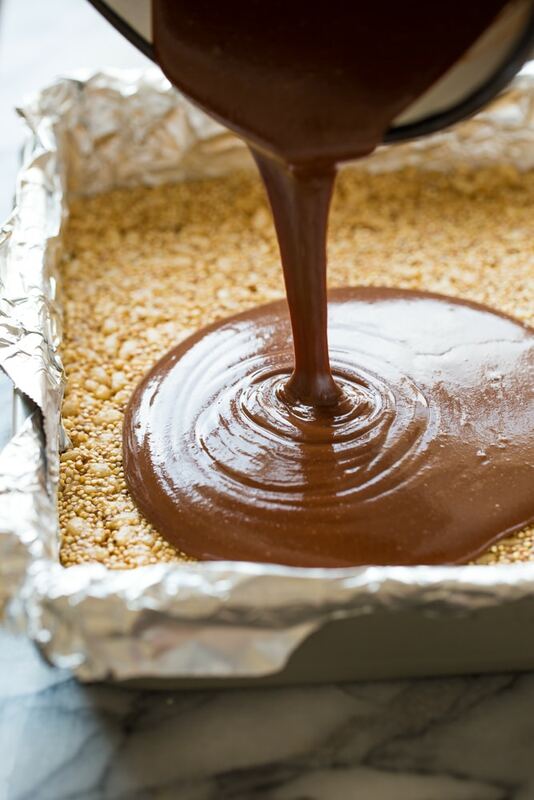 Mix it all up well and then press into a lined baking tin. The chocolate peanut butter layer is just as easy to prep. In the same sauce pot you were just using melt and mix some more peanut butter, maple syrup, coconut oil and cocoa powder. In less than a minute you’ll be whisking up a thick, rich chocolatey fudge that you just need to pour over your rice crispy layer. Place in the fridge (or freezer if you’re feeling impatient) and let these bars set for about 45 minutes to an hour. The longer they set the easier they’ll slice later. 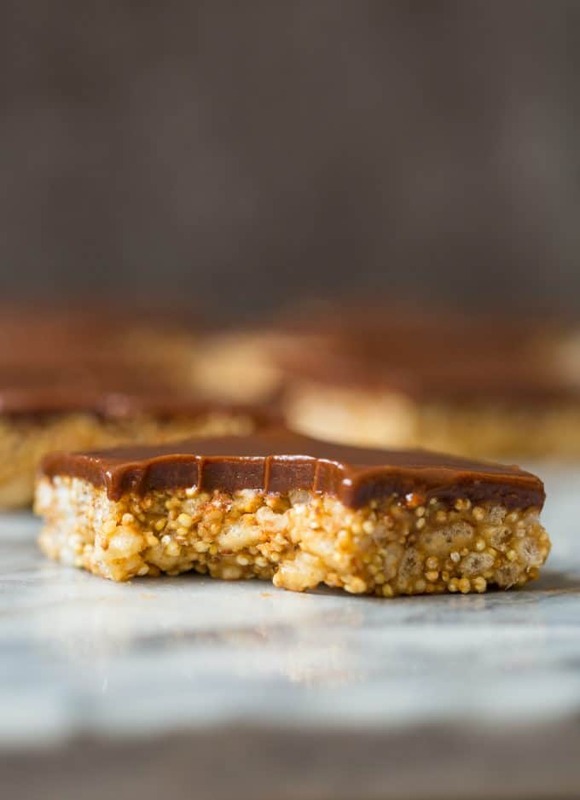 An easy, peanut buttery treat without even turning on the oven. Don’t forget to #asaucykitchen on instagram if you try these Toasted Quinoa Peanut Butter Scotcharoos! I love seeing what you make! You can also post your pictures to my facebook page! Place the quinoa in a fine mesh sieve and rinse it well under water. Pour the wet quinoa in a medium skillet or wok over a medium low heat. Stir with a wooden spoon and cook until the quinoa dries. Turn the heat down low and continue to toast the quinoa until it begins to crackle and pop. Keep toasting a minute after the popping begins stirring every so often. Remove from heat. 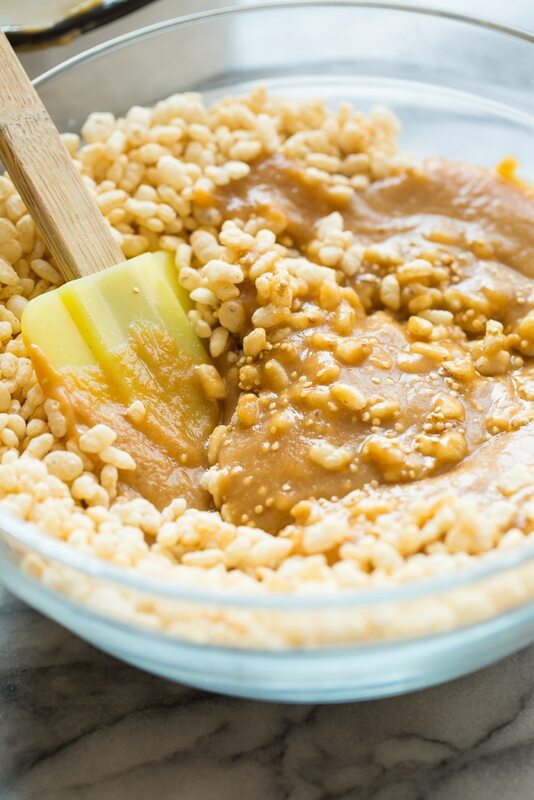 In a medium sauce pot over a low heat add the peanut butter, maple syrup (or sweetener of your choice), vanilla and salt. Stir until the mixture is all melted together. Stir in the rice cereal and popped quinoa. Quickly wash & dry out the sauce pot you were just using. Over a low heat stir together the peanut butter, coconut oil, maple and cocoa powder until combined. Pour over the rice cereal mixture and let cool about 5-10 minutes before transfer to a fridge to set fully another 30 minutes. When your bars are set just slice and serve. Keep these stored in the fridge - will keep for about 3 days. Thanks Erika! I should have made that more clear in the recipe – thanks for pointing that out to me so I can specify it! Do you have to use coconut oil, or will a different oil be ok?